1. Who founded Incredible Smiles, when and where? 2. What is Dr. Lori Kemmet's background? 3. How many people are on the staff at Incredible Smiles? 4. Does Incredible Smiles have a particular niche in dentistry? 5. What sets Dr. Lori Kemmet apart from other cosmetic dentists? 6. Why does Dr. Lori Kemmet call her patients ``guests``? 7. What celebrities have an ``incredible smile`` thanks to Dr. Lori Kemmet? 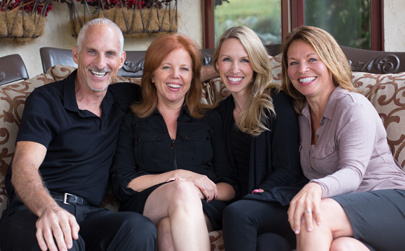 Dr. Lori Kemmet, DDS founded Incredible Smiles in 1993 in Boulder, Colorado. Dr. Lori Kemmet grew up in Minnesota and her passion for dentistry grew out of her mother’s career as a dental receptionist. Dr. Kemmet graduated from the University of Minnesota, and spent three years as a dentist in the Air Force. She has been practicing dentistry since 1989. Since 1998, she has been an instructor of advanced aesthetic courses at The Las Vegas Institute for Advanced Dental Studies (LVI)* – teaching other dentists from around the world. Dr. Lori Kemmet is respected in the field of neuromuscular dentistry. She instructs other dentists in hands-on courses designed to teach neuromuscular and cosmetic dentistry. She believes that when you teach you also learn. Dr. Kemmet is is a constant learner and always taking a continuing education course. Dr. Kemmet creates “Incredible Smiles” by combining her technical training with an artistic and skillful eye. She has a unique approach to shaping and customizing each tooth. During a smile enhancement, Dr. Kemmet builds each tooth with composite and then reshapes, shortens or lengthens each tooth to be most flattering to the guest’s face shape, eyes, smile shape, height, and even lifestyle and personality. She doesn’t rely on a laboratory to design a smile for her guests. Instead, she sees the process through its entirety, and she works with one ceramist with whom she is in constant communication. The ceramist is exclusive to Dr. Kemmet’s practice and makes custom veneers from the finest materials available today. Dr. Kemmet is the first female dentist and one of the first two dentists in the nation to be awarded the title of Mastership in the area of Neuromuscular and Cosmetic Dentistry from The Las Vegas Institute for Advanced Dental Studies (LVI)*. She also teaches advanced aesthetic courses at The Las Vegas Institute for Advanced Dental Studies to other dentists, like Kawana Dental, all around the world. In addition, Incredible Smiles runs its office differently from the traditional dental practice. Dr. Kemmet describes her office as soothing, comforting and elegant. Walking into Incredible Smiles is a bit like walking into a relaxing retreat. While focusing on exceptional dentistry, Incredible Smiles also offers the following services: paraffin hand wax dipping, reflexology and massage by a certified massage therapist, Bose® head phones, soft blankets and VIP express check out during each visit. Guests who come to Incredible Smiles for smile enhancement receive a high-end gift complete with a custom-labeled bottle of wine and two wine glasses or a pound of fine coffee and a coffee mug with logo. 9. How long does teeth whitening last? 10. Will teeth whitening be harmful to my teeth? 11. Who is a good candidate for teeth whitening? Unlike porcelain veneers, regular teeth are porous and susceptible to staining. Teeth stain at different rates depending on mouth chemistry, diet and lifestyle (foods and drinks consumed), so how teeth stain and how easily they whiten varies from person to person. There are numerous methods of teeth whitening that range in price and ease of use. The premise behind most teeth whitening methods is essentially the same — a form of hydrogen peroxide finds its way into the pores of the teeth and bleaches stained particles. The variable is in the type of application and the corresponding strength of the whitening gel. What works well for one person may not work well for another. At Incredible Smiles, we recommend a complimentary consultation before making a choice so that your time and money are well spent. Zoom teeth whitening studies indicate that results can last two to three years. Longevity will obviously vary depending on each person and their lifestyle. Most people will choose to use one of the many simple methods our office provides to maintain their white teeth over time, once the initial whitening has occurred. No. Studies have shown that with normal or suggested use of teeth whitening products, there is no harmful effect on teeth. It is common for some people to have some sensitivity to the teeth whitening products. There are two kinds of stain on teeth — superficial and inherent. Superficial stain comes from the things we eat, drink and expose to our teeth. This kind of stain is usually yellowish in nature and yields the best results with teeth whitening systems. Inherent stain comes from things we absorb into our bodies such as minerals, fluoride and various antibiotics such as tetracycline. Ingested especially at key developmental phases in life these substances can permanently discolor teeth to the point that no teeth whitening system will have a positive effect. People with inherent stain will often choose to whiten their teeth with veneers, which addresses the teeth color as well as length and shape. 12. What is cosmetic dentistry? 13. What are some examples of cosmetic dentistry procedures? 14. Why would someone need or be interested in cosmetic dentistry? 15. How has technology improved in cosmetic dentistry? 17. What is a cosmetic veneer? 18. How long do veneers last? 19. Will veneers eventually stain? 20. Is there a difference in quality among various types of veneers and crowns? 21. What is bonding and how is it different from a veneer? 22. What is an all-porcelain crown or veneer? 23. What can be done for excessive gum tissue? 24. Is cosmetic dental work expensive? 25. Is there a payment program option other than insurance? Cosmetic dentistry is dental treatment that improves the beauty and health of one’s smile. Nearly every dental procedure has two elements: Aesthetics and function. A quality cosmetic dentist takes both of these elements into consideration; so that one may rest assured they will not only look great, but enjoy hassle free long-term results. Cosmetic dentistry covers a multitude of procedures from smile teeth whitening to repairing, straightening, replacing or enhancing the appearance of one’s teeth and smile. Most common is the use of Cosmetic Veneers or Laminates. These thin, but durable restorations are much more conservative to the natural tooth than traditional crowns, and have become a very popular way to enhance a smile. In certain procedures dental bonding can be a way to shape teeth as well. Cosmetic dentistry provides more than just a beautiful smile and a healthy mouth. According to the American Academy of Cosmetic Dentistry (AACD), cosmetic dentistry has also been shown to improve a person’s overall health and emotional well-being. An improved smile can boost a person’s self-image, making them more confident in their daily lives. Cosmetic dental techniques have advanced dramatically over the last decade. The qualities of materials such as porcelain and composite resins have improved, giving a more lifelike appearance. And where gum-tissue surgery and contouring was once performed with scalpels, lasers now provide fast, non-surgical results. If you are happy with the shape and color of your teeth, then orthodontic teeth straightening may be a good option for you. If you want to whiten and enhance the shape of your teeth as well as straighten them, then cosmetic dentistry will give you the results you are looking for while saving you time and money. Clear teeth aligners provide a great alternative to traditional braces. Invisalign is the latest generation of “invisible” teeth aligners. Though not always necessary, some people will choose to undergo some teeth straightening prior to be fitted with cosmetic veneers. Modern metal-free dentistry has evolved to a point where we can be much more conservative with tooth preparation. A dental veneer is essentially a conservative crown. Rather than encompassing the entire tooth, a cosmetic veneer essentially covers the visible part of a tooth preserving a large amount of the natural tooth structure. Veneers can straighten, lengthen and whiten teeth to provide the desired smile and bite. Each veneered tooth must be shaped. This means that an outer layer of the natural tooth structure is removed to allow space for veneer placement. When “seated” correctly, veneers are strong and can last for many years, even a lifetime with good oral care. Yes. Aesthetic dentistry is the ultimate blend of art and science. If quality and service are important to you, look for experience, proven results, and a focused approach to your unique needs and desires. There are many different materials used in veneers and crowns. There are also a variety of commercial brand name veneers, including Lumineers™, DuraThins™, and DaVinci Veneers™, to name a few. Incredible Smiles creates all restorations with the help of one ceramist dedicated exclusively to Dr. Lori Kemmet and her team. Many restorations are designed with a metal lining covered with porcelain (porcelain fused to metal or PFM). They appear “flat” because the metal does not let light pass through like a natural tooth does. There is often a dark line next to the gum line that is undesirable (often the metal irritates the adjacent gum tissue in the form of an allergic reaction). Always inquire! Dentists will say that it is porcelain. And it is…on the outside. Dr. Kemmet provides 100% all-porcelain restorations. When properly seated, they are as strong as or stronger than their metal predecessors. And the appearance is strikingly similar to a natural tooth, allowing light to pass through (referred to as translucency). Sometimes people have too much gum tissue or there is an asymmetry of the tissue across the smile. The solution is simple. A specialized soft-tissue laser can remove the excessive gum tissue. There is always a margin of tissue that can safely be removed to further enhance a smile. This non-surgical and pain-free procedure is completed in a matter of minutes. Cosmetic dental work is probably not as expensive as you think. The cost of cosmetic dentistry depends on how much you want or need. Like any cosmetic process, costs will vary with the amount of product or services you desire. A skilled cosmetic dentist can explain various fees and the best procedure for you. Also, some cosmetic dental options are covered by insurance if “need” can be established. People often take advantage of a monthly payment plan provided through Capital One. In many cases insurance will assist with any “needed” dentistry. In general, because of limits insurance companies place on dentistry, most people elect to pay their own fees. As a benefit to our guests, we provide a monthly payment program that makes restorative cosmetic dentistry affordable to most anyone. We also provide a no-interest, same-as-cash program to qualifying guests. 26. What is Full Mouth Restoration? 27. What causes TMJ pain? 28. Why should you choose Dr. Lori Kemmet for Full Mouth Restoration? 29. What is the Las Vegas Institute Mastership (LVIM)*? 30. Who has neuromuscular problems? 31. What are the treatment options for neuromuscular problems? 32. What does Full Mouth Restoration entail? 33. How are the jaw muscles relaxed and the correct jaw position located? Full Mouth Restoration, sometimes called neuromuscular dentistry, is the individual restructuring of each and every tooth. The goal of Full Mouth Restoration is to restore ideal occlusion (bite), therefore alleviating tension or pain from TMJ (temporomandibular joint or jaw joint) problems. Neuromuscular dentistry is a practice founded on the belief that a healthy smile begins with healthy function. This method of TMJ treatment determines the optimal physiological position of the jaw by measuring the relaxed position of head and neck muscles and then repositions the jaw to achieve those exact measurements. Dr. Lori Kemmet has had extensive training in Full Mouth Restoration at The Las Vegas Institute for Advanced Dental Studies (LVI)*. She has been teaching advanced cosmetic and full mouth restoration courses at LVI since 1998. In 2004, Dr. Kemmet earned the title of Mastership from LVI. She is now one of 12 dentists worldwide to obtain this award. This award recognizes her knowledge in the field of neuromuscular dentistry. To apply for Mastership, a dentist must have completed the highest levels of training at LVI. She or he must submit three Full Mouth Restoration cases documented to exact specifications. One of the three cases must have been a person experiencing TMJ pain. Finally, a comprehensive written exam must be taken and passed with a score of 90% or higher. This examination acknowledges a dentist with advanced neuromuscular and cosmetic dental skills. Anyone can experience neuromuscular problems usually known as TMJ pain. Typically, those who were born with poor jaw position or improper bite (malocclusion) begin to experience problems in their teen years. Others who have had a history of teeth grinding may begin to have symptoms in their mid-40’s or even earlier. Problems that can be addressed with neuromuscular dentistry include broken or missing teeth, as well as old, decaying dentistry and TMJ pain. When there is an imbalance in the muscles that open and close the jaw and/or bite then tension is created causing pain. Fortunately, there are great ways to address neuromuscular problems. Neuromuscular issues require a neuromuscular approach and solution. Dr. Lori Kemmet uses a computerized diagnosis called Myotronics to both relax and determine ideal occlusion. Treatment options include an orthotic that temporarily repositions the bite the same way as bite guard therapy. Orthotic therapy always precedes Full Mouth Restoration. The other, more fixed solution is the ideal restoration of each tooth (Full Mouth Restoration). Both approaches seek to alleviate pain and tension in the jaw, head and neck. Full Mouth Restoration is the complete restoration of each and every tooth to an optimal shade, length, shape and position. This technique involves a preliminary information-gathering visit. Incredible Smiles uses special computer diagnostics and neuromuscular methods to relax the jaw muscles. Once Dr. Kemmet knows where the muscles and jaw are most comfortable, this information is used to make an orthotic that supports the comfortable position. Once comfort is established with the orthotic, the next visit is called the preparation. At this four-hour visit, she removes old dentistry and prepares each tooth. Guests leave the office with temporary restorations that position the occlusion optimally. Three to four weeks later, Dr. Kemmet removes the temporaries and permanently “seats” each restoration. Myotronics is a computerized process that helps determine the proper relationship between the upper and lower teeth for each individual. During this phase of treatment, the jaw muscles are relaxed by “tensing,” a technique often used by physical therapists to relax muscle spasms. Muscle tension is monitored on a computer via special sensors that read muscle impulses to determine when full relaxation has occurred. This two-to-three hour process helps to determine where the individual teeth should be restored so that they are comfortable. When the teeth are functioning in the correct bite position, the muscles and soft tissue around the head and neck remain relaxed. 34. What is a dental implant? 35. How is a dental implant different from a dental bridge? 36. How long does the Dental Implant process take? A dental implant literally replaces a missing tooth. A dental implant simulates the root of a tooth to which the cosmetic dentist attaches a cosmetic tooth. A dental bridge, on the other hand, is non-surgical and uses the adjacent teeth to support a new cosmetic tooth. A dental implant is not invasive to surrounding teeth (especially desirable if they are healthy and in good condition). By simulating the root, it engages the bone and keeps it healthy. Because a dental implant is an individual tooth it is also easier to floss. A dental bridge can be a good choice if the adjacent teeth are in need of restoration. However, there are other subtle factors such as age, timing and bone health that you should discuss with Dr. Kemmet when deciding which options may be best for you. 37. What is Restorative Dentistry? 38. Who would benefit from Restorative Dentistry? 39. How long doe Restorative Dentistry take? 40. Can I still get tooth decay after? Restorative dentistry replaces old mercury fillings, old ugly crowns and composites that have become discolored. Restorative dentistry repairs cracked teeth and/or missing teeth. We are renewing the teeth that need help in a comprehensive (all inclusive) manner, which is an investment that saves time and money. Restorative Dentistry is ideal for an individual wanting to renew restorations in a couple easy visits to ensure overall oral health and a beautiful smile that feels good. He or she may be tired of “piece-meal” dentistry that never seems to quite solve a problem with a tooth. They may feel that their bite is always just a little bit “off.” By comprehensively addressing numerous teeth all at once (in some cases an entire upper or lower arch) then length shape and health can be restored to a more ideal state. Restorative Dentistry is usually accomplished in two visits – each ranging from 2 to 4 hours depending on the procedure. Any place where there is an actual porcelain restoration – whether it is a veneer or a crown, will not be susceptible to decay. However, any uncovered area of the natural tooth structure (including the root surface and area under gum tissue) is vulnerable to decay. Continuing with regular dental hygienist visits (as well as good home care) will help preserve the integrity and health of your teeth and preserve your investment. 41. Why do I need to have my teeth cleaned and how often? 42. What is the cosmetic maintenance required for my Incredible Smiles Veneers? 43. Why choose Incredible Smiles for cosmetic maintenance? 44. Are X-Rays really necessary? 45. Do cavity fillings need to be obvious? There is more happening than just a “teeth cleaning” at an advanced dental office. The primary aspect of the visit is to remove tarter and calculus (hardened prolonged buildup) from around the teeth and under the gum where floss and a tooth brush do not reach. The hygienist will measure the depth of the “pocket,” or space, between the tooth and gum. These measurements should be taken at least once a year. Up to three millimeters is considered healthy, as this is the barrier between the exposed part of your tooth and the inner workings of your body. Three millimeters is also the maximum depth that floss will reach. When people don’t floss as often as necessary, dental cleaning visits are even more important. A visit every six months is recommended for people in good oral health who floss and take good care of their teeth and gums. For some people, more frequent visits may be necessary as recommended by the hygienist. You should be able to stay on regular dental teeth cleaning visits. Cosmetic restorations do not stain and they are unlikely to have any buildup over time. But the natural tooth adjacent to the restoration and the area under the gum needs the regular attention of a skilled hygienist. With good personal and professional care, cosmetic restorations can last a lifetime. Once a guest in our practice receives the benefits of cosmetic dentistry, they may return for follow-up care because of our attention to detail and our expertise with leading-edge materials and cosmetic dental techniques. We would be happy to provide you with information regarding the care of your cosmetic dentistry should you choose to return to your general dental office. X-rays are necessary to detect decay between teeth and areas not visible to the naked eye. Since gum and bone problems happen slowly over time, they are often not felt or detected from the surface. X rays are also necessary for detecting bone loss and infections at root surfaces. Many people are understandably concerned about excessive radiation. Incredible Smiles takes digital radiographs, which use 80% less radiation than conventional techniques. 47. Why are straight teeth important? 49. Why should I choose Dr. Kemmet for my Orthodontic treatment? Invisalign is the advanced way to straighten teeth and improve smiles. Using the latest medical imaging technologies, Invisalign manufactures precision polymer aligners that rapidly straighten teeth. Using a precise 3-dimensional analysis of your teeth and adjacent tissue, Invisalign crafts personalized aligners for our guests. Each aligner is worn for approximately two weeks, and can be removed to eat, brush, floss, and on special occasions. During wear, the teeth are gently moved to their ideal position. The length of the process depends on the specific situation and the results each person wants to achieve. Clear – most people won’t even know you’re wearing them. Comfortable – Invisalign aligners are gentle to your mouth. Removable – take them out to eat or brush, then put them back in again. Hygienic – surfaces are easy to keep clean. Affordable – in most cases, the cost is comparable to metal braces. Fast – treatment time is comparable and in many cases less than that of traditional braces. An average Invisalign course of treatment takes about one year. Teeth that are straight and properly aligned create a more perfect bite, and that avoids excessive stress, headaches, and strain on your supporting bone and tissue. Are clearer – Invisalign aligners are the “clearest” on the market. Stay clearer – Invisalign aligners do not “cloud” during treatment. Are more hygienic – the smooth surface of Invisalign aligners have no ridges to trap bacteria, and are easier to clean. Are more comfortable – Invisalign’s revolutionary manufacturing process creates the most precise aligners on the market today, ensuring the most accurate fit. Dr. Kemmet has had training in the art and science of occlusion. Orthodontics is not just about creating straight teeth; it is also about establishing a healthy, long-lasting biting position for the teeth. Crooked teeth often result in excessive wear that can lead to a variety of long-term problems. Dr. Kemmet understands the importance of function and aesthetics. For the added convenience and care, many people choose Dr. Kemmet for teeth straightening to achieve the proper positioning prior to proceeding with cosmetic veneers.